Recorded on December 26, 2010. 2010 the year Brian John Mitchell & Kurt Dinse made contact – http://www.silbermedia.com/star actual link to read it for free if you don’t have the dollar. 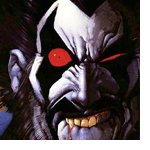 I remembered Simon Bisley mainly for his painted type of stuff & I was a little let down on this Lobo book. Also I was even more upset that BJ McKay & Bear (sheriff Lobo’s nemesises) didn’t appear as truckers. For superhero stuff – I think stories outside if cannon are better. Telling “elseworld” type stories with established characters are better than stories that require you to know 10 years of story development. Most of the stories they write get repealed through “crisis” events like House of M. Forget everything you’ve read, we’re resetting everything anyway. Good examples: All Star Superman, Astonishing X-men.